The most hollow headed man we have ever heard of, who seems to forget his senses at home most times, is one Sir Webson Henry Chukwudi the acclaimed president of Nigeria RICE Initiative, who has his fraudulent and criminal office in Australia. He specialises in scamming innocent victims around the world. The so-called Chukwudi, and other political scavengers have collected millions of dollars from Atiku Abubakar and his political party PDP, to attack our supreme leader Mazi Nnamdi Kanu and IPOB members. This imbecile, thought that by attacking Mazi Nnamdi Kanu and IPOB he will gain popularity in Nigeria's political space. But little did he know that IPOB thrives in criticism and critical judgement. This baby Oluwole forgery learner claimed that our supreme leader was bribed by APC government to work with them, forgetting that he is not talking to only Almajiris, who have no capacity and desire to reason. The beauty of the great IPOB, ably led by Mazi Nnamdi Kanu, is her consistency and strong resolve to achieve total freedom for Biafra. 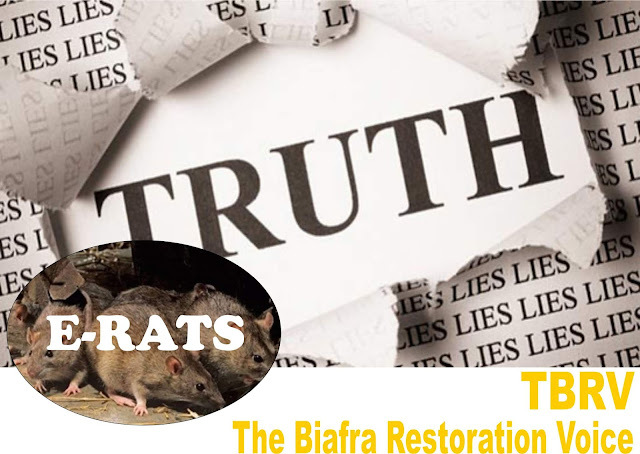 IPOB does not care who occupies Nigeria seat of power in 2019 or who will get it in 2023, neither do Biafrans have interest in vice presidential slots. All we are working towards is total freedom of Biafra. So, it is crass ignorance on the side of the so-called Sir Webson Henry Chukwudi, to have claimed that our supreme leader has been bribed to work for APC government. This scammer called Webson should steer clear in any issue relating to Mazi Nnamdi Kanu led IPOB. The resolve of Biafrans to boycott Nigeria's already rigged charade called election, as part of our ideology to achieve Biafra through nonviolent approach, does not in any way translate to ignorance or weakness. Rather, it is the most civilised way of approaching critical issues in an uncivilized environment like Nigeria. Rather than criticising IPOB supreme leader Mazi Nnamdi Kanu he should be applauding his firm resolve to achieve Biafra freedom through nonviolent approach. So, we advise the so-called Sir Webson Henry Chukwudi to concentrate on his scam business and leave IPOB and Nnamdi Kanu out of his numerous baits he uses to ensnare his unscrupulous, though unsuspecting victims. It is within the right of Biafrans to vote or boycott any election we considered inimical to our ideology. Therefore, lovely Biafrans, do not forget to cast your vote for BIAFRA FREEDOM as you BOYCOTT the charade called election ON 16TH OF FEBRUARY 2019, by SITTING AT HOME IN YOUR OWN HOUSE. Do not forget to tell your neighbours as well. For true Biafrans, remember the Biafra referendum and election boycott evangelism days to keep them holy (the 11th commandment).